I was choosing a restaurant for my guy's birthday, and kind of got distracted thinking about all my favorite restaurants. An hour later with a rambling stomach I had this list, and a desire to book plane tickets. Do not get me wrong France and Geneva have good restaurants, but nothing here beats these genius places. Axe on Abbot Kinney in Venice Beach must be my favorite restaurant. This is how all restaurants should be, serene, uncomplicated, in its decor and dishes that are made with local and organic ingredients. 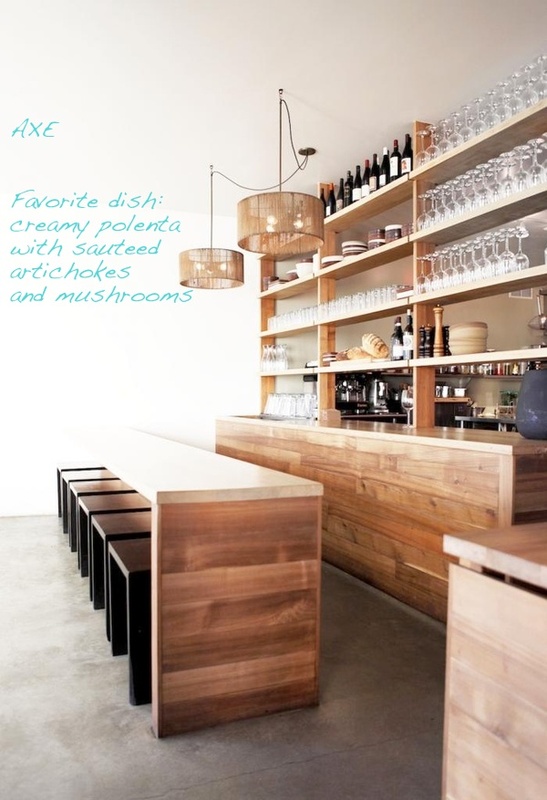 If I could afford a chef, he could just follow Axe's menu, their dishes cover everything I like. And lets not forget, they have a selection of cookies for dessert and it is near the Ocean. I can't wait to go back to Venice! London for me is Zuma. It is the first thing we make sure we have a reservation for whenever we go. Contemporary Japanese cuisine, Again an informal place, and beautiful, but it doesn't matter, you will look only at your food, delicate, refined, exquisite! And you will be so happy. In Italy you could go to the restaurant of a camping and eat well. Once I was in a small beach town near Naples, a guy came with his fishing boat, went to this wooden shack and started making sandwiches with his fresh caught fish. One of the best things that I ever have eaten in Italy. But if you ask me tomorrow, I can tell about the pizza at Campo dei Fiori, or the spaghetti alle zucchine da Maria Grazia. Anyway before I get too hungry, two of the restaurants I always get back to. Fiumara Beach in Tuscany, in the wild Maremma region. There you can also eat fresh fish on the beach, but this shack is a luxurious one, you can even reserve a beautiful tent for you and your friends. Gusto in Rome, is an enormous complex on Piazza Augusto Imperatore. I used to work on the same square and love going back there. 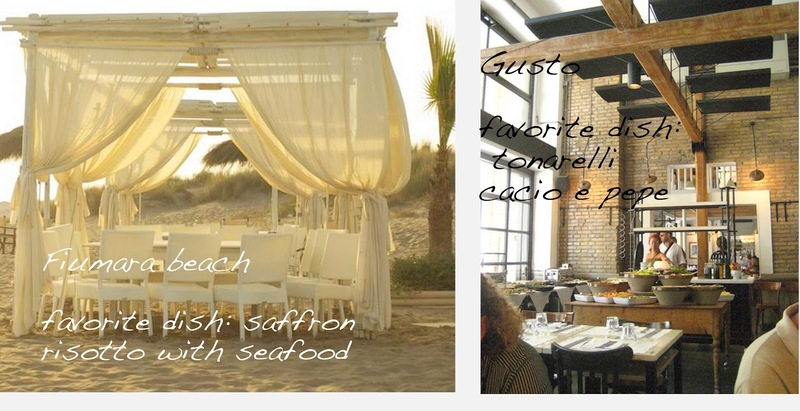 Gusto has a restaurant, a pizzeria, a cafe and an Osteria that I can really recommend. On Sunday there is a nice antique market right in front and you can get brunch. My favorite Dutch restaurants are both are located just out of the center, in gorgeous buildings, but could not have been more different. Bazaar In Rotterdam is multicultural with North African and middle Easters dishes. How gorgeous are all the Moroccan lamps that they hanging from the wooden ceiling!